Madrid has quite a few tapas restaurants to choose from, in Native Spanish Tapas we take you where the locals go to have the best Madrid tapas tours. Some locals intentionally go to some of the oldest Madrid Spanish tapas for some of the best Spanish tapas in Madrid and for its historical significance. The number of years a restaurant has been operating is impressive enough, so let’s have a look at the top five oldest restaurants in Madrid. Botin, founded in 1725, it’s the oldest standing restaurant in the world according to the Guinness book of world records. The authenticity of the establishment is that it hasn’t changed a lot and continues serving Castilian menus and Spanish tapas. Suckling pig is their star plate. Botin was one of Ernest Hemingway’s favorite restaurants in Madrid. Casa Alberto, founded in 1825, it’s located in the poet’s quarter of Las Letras in the heart of Madrid. It’s known for its traditional Madrid style tapas such as callos or pig-tripe stew and snails stew. A must. 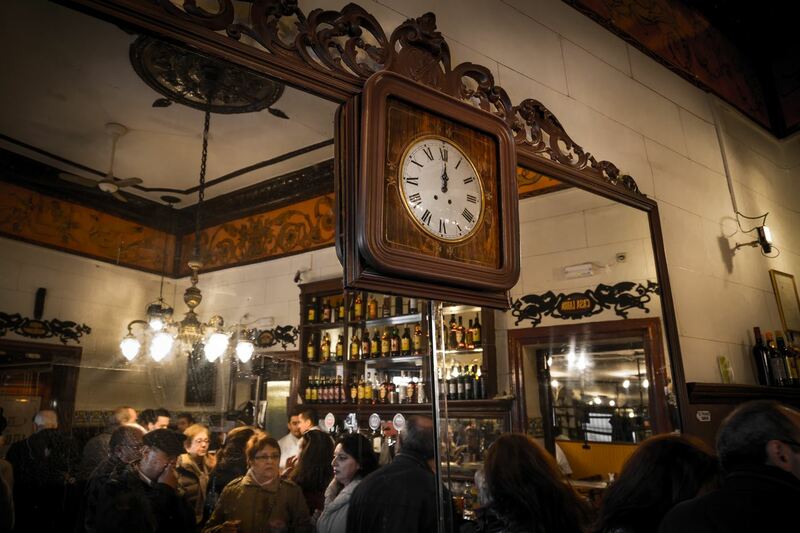 Taberna Antonio Sánchez, in third place, it was founded in 1830, it’s like going back in time because the tavern still conserves the old tiles on the wall, gas-lamps on the ceiling and even uses the original cash register! It is also very famous for its typical traditional Madrid Spanish tapas. King Alfonso XIII was known to frequent this tavern. Lhardy, although it opened up as a baker in 1839, it eventually became a restaurant. It is quite big with three floors and six different dining rooms. It has kept its old charm as all other older Madrid Spanish tapas restaurants serving some of the Madrid Spanish tapas. They say that Queen Isabel II used to meet her lovers her, worth checking out. Viva Madrid, from 1856, its tiles extend from the façade of the building right inside of the tavern. It has evolved quite a bit in the last years, during the day it’s a traditional Madrid Spanish tapas bar and at night they serve drinks and cocktails in their quaint terrace. Worth checking out. Join us for one of our Madrid Tapas tours where we guide you deep inside the lively Madrid tapas culture!